Sean Miller, prolife author and guest blogger for this site, will introduce his new book, Full of Life, at a “Meet the Author,” presentation at the Hillsdale Library in Hillsdale, N.J. on Tuesday, Sept. 27 at 7 pm. He will be joined by staff of the New Hope Pregnancy Center in Englewood, N.J., an outreach organization for first-time single mothers in a crisis pregnancy situation. New Hope provides subsidies for housing, daycare, education, and counseling and commits to new mothers, helping them tend to their everyday and emergency needs via a one-on-one Mentor support system. Come out to support Sean and hear about New Hope and his new book. The address of the Hillsdale Library is 509 Hillsdale Ave, Hillsdale, NJ 07642, It’s only 13 minutes from Pearl River, an easy drive. Sean Miller, a guest blogger for this website, recently published his first book, Full of Life, a collection of prolife writings. It became available on Amazon last week. The book is meant to celebrate the Gift of Life and to provide inspiration and encouragement for all of us to stand up for life and support those in need – both the unborn baby and the mothers and fathers of the child. 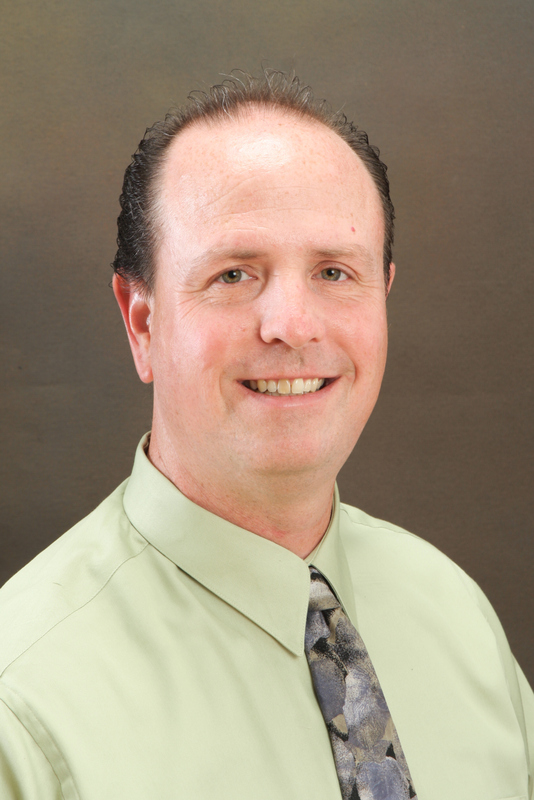 Many of you know Sean, who’s been active in the prolife movement since 1994. 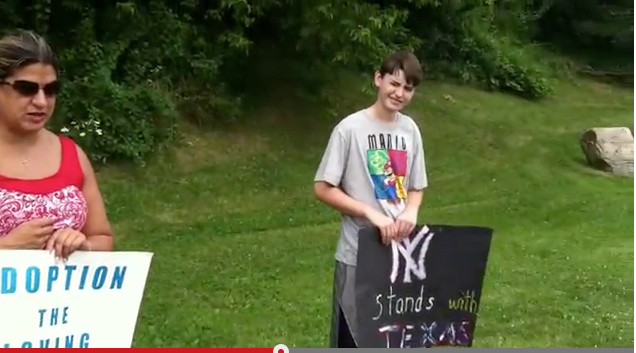 He’s from “over the border” in Bergen County, but frequently works closely with prolife groups here in Rockland. His 21 essays originally appeared on this website, but Full of Life presents them in one source. 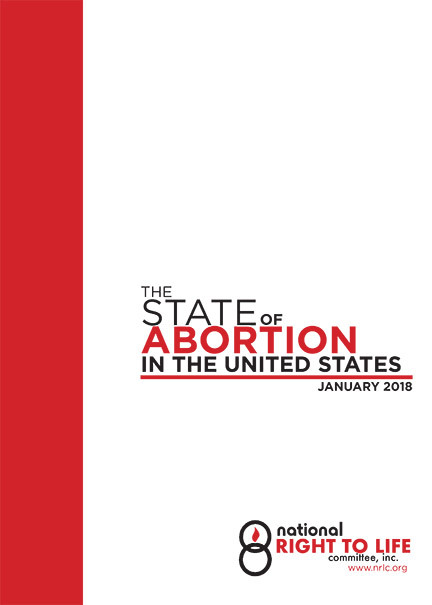 The essays are not intended to be biographical, but if you read them all you’ll find insights into the heart of a man who journeyed from mixed feelings about abortion as a college student to the front lines of the struggle – the sidewalk outside the abortion clinic where he strives – with never-failing love, compassion, and gentleness – to be a “last lifeline of hope” for a desperate pregnant woman about to enter its doors. Our good friend from New Jersey, guest blogger Sean Miller, recalls the first time he marched for life in a St. Patrick’s Day parade. It was the first time I was going to march in a parade. And it wasn’t just any parade. It was the annual St. Patrick’s Day Parade, dear to my heart for a number of reasons. First of all, I’d be celebrating my Irish heritage of which I am very proud, and I’d be honoring St. Patrick, my namesake. (My middle name is Patrick). Also, I’d be representing the unborn, marching with the local right-to-life group. In a rather hostile, modern world, that was a challenge I was proud to take up. Sidewalk Counseling: Harassing or Helping? Here’s the second part of guest blogger Sean Miller’s posting on sidewalk counseling at abortion clinics. Sean, an experienced counselor, explains how an offer to help is often perceived as harassment. 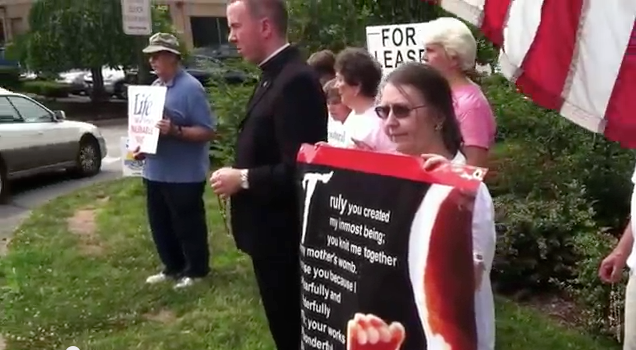 The atmosphere in front of an abortion mill can be surreal. Not surprising considering what is going on within its walls. So for a sidewalk counselor to be able to function and not dissolve into a pool of tears, you have to put up a protective wall within. Remember, this is a spiritual battleground, and there is no time to be absorbed in “how I feel.” These are the front lines! The matter at hand demands two necessary ingredients: prayer and counseling. They are interdependent. All must be done in a spirit of deep humility, silence, and compassion, with the understanding that we are present for these troubled couples so that we can help them in their time of great need. July 11 — Seminarian David Rider led the Rosary as Rockland prolifers prayed for the protection of LIFE and for the state of Texas to lead other states in banning late term abortions, 20 weeks and older when the baby in the womb can feel pain and is capable of surviving outside the womb. The rally took place outside the Planned Parenthood office on Perelman Road in Spring Valley. Today members of the Texas state Senate approved a bill to ban abortion after 20 weeks by a 19-11 vote. The House passed their version of the bill on Wednesday. Now the bill will go to prolife Gov. Rick Perry, who will sign it into law. After a day filled with pro-abortion threats, pro-life people hiding in secure areas of the capitol fearing for their safety, jars of feces and urine and protestors disrupting the Senate proceedings, democracy finally prevailed. A previous attempt to pass this bill in the Texas Senate was halted by a pro-abortion filibuster by state Sen. Wendy Davis. Davis said she would not filibuster the bill a second time. This debate had been marked by angry protests from pro-abortion demonstrators and even a death threat to prolife Gov. Rick Perry. The bill relies on the science of fetal pain to establish a constitutional reason to ban abortions late in pregnancy. On June 18, by a 228-196 vote, the U.S. House of Representatives also passed a bill that would ban all abortions starting at 20 weeks’ gestation. Rockland’s representative in the House, Nita Lowey, voted against this bill. At the time, the Obama administration issued a statement indicating that President Obama would veto the bill if ever passes in the the Democratic-controlled Senate, which is unlikely. 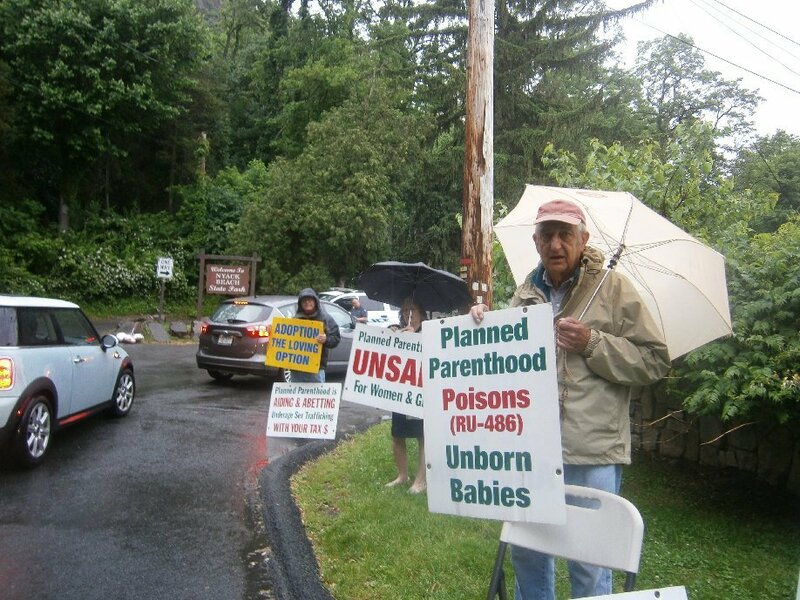 Prolifer demonstrators were there when Planned Parenthood Hudson Peconic supporters arrived at at Nyack Beach State Park for their 80th Anniversary Celebration. On March 9, the Youthfest was held at Rockland Community College. It’s an annual event whose goal is to provide the community with an opportunity to interact with businesses and agencies that provide services for children, youth, and families in Rockland County. Unfortunately, Planned Parenthood Hudson-Peconic was on hand, with their propaganda and big display van, eager to meet our youth. But Eileen was there too. 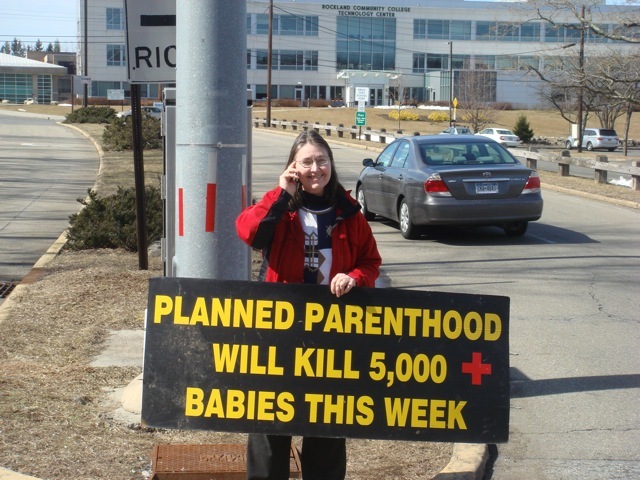 Armed with her sign at the entrance to the campus, she reminded everyone about the truth about Planned Parenthood.